There’s a certain intoxication that comes with having your first credit card. On the surface it looks like a healthy dose of financial freedom – after all, you’re able to spend money that you don’t really have. But that freedom can quickly turn into a pair of handcuffs if you run up a balance that you can’t afford to payoff. In the adult world, it’s often said that credit cards should not be considered as an extension of your paycheck. As a student, you probably don’t even have a paycheck, so the implications are even greater. The whole purpose of having a credit card in school is so that you can pay for unexpected expenses, not day-to-day living expenses. If money is tight, you need to live within a budget, not swipe a credit card when ever you can’t afford something. Having one credit card is flirting with danger, but you are taking a dive into a pit of fire by having several. As a student, you should only need a single credit card to cover whatever need you have. Maintaining multiple cards – whatever the superficial reason might be – is setting you up to go deep into credit card debt. If you have a single credit card with a credit line of $2,000, that limit will keep you from ever getting any deeper into debt. But if you have three credit cards – each with a credit line of $2,000 – then you could end up going $6,000 into the hole. You can avoid that fate but keeping only a single credit line open. 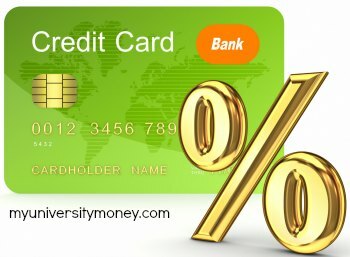 As a university student, you are a prime potential customer for credit card issuing banks. They want to get your attention, and your business, as early in your life as possible, and keep you as a customer as your financial situation in life improves. It’s no secret, the banks know that university graduates represent potentially higher income and net worth later in life. They will do whatever it takes to get your business before you graduate. That can lead to some seriously attractive offers. You’ll see rewards points, cash back, interest-free purchases – you name it – all in an effort to get you to take their credit card now. As a student, it’s hard not to believe that you are someone important when you get all of the special offers thrown at you. But you have to resist the temptation to think just that. As a student, you’re in no position to take these offers and then get yourself buried in debt. And that’s exactly what could end up happening if you accept these offers and begin making credit cards a regular part of your life. Make it a personal money rule right now that you will never charge more on your credit card than you can reasonably afford to repay, generally within 30 days. You have to establish some sort of control in regard to credit card use, and this rule is a pretty standard one. If you never borrow more than you can pay back within a month, that will keep you from spending more than you should. You probably have a rough idea how much money you will have coming to you in any given month, and that needs to be the limit on your spending. If you exceed it – especially if you do it too many times – you’ll end up carrying a very large balance that will not only cut into your cash flow (making monthly repayments), but will also further limit your ability to borrow in the future. A maxed-out credit card is one of the worst possible outcomes. The best way to avoid this entirely is by paying most of your expenses in cash or by a debit card attached your bank account. That will largely eliminate the need to use a credit card, and make it easier to pay off the balance if you do. You shouldn’t be using your credit card to go to the movies, to buy a beer, or to get a latte at Starbucks. If you can’t afford to pay for these purchases through non-credit card sources, then you can afford to have them. Save your credit cards for emergency situations, where you must make a purchase that exceeds your current resources. This could involve buying a necessary item that you need for school and don’t have the cash for. Or it could be the need to buy a plane ticket for a sudden return home. You should keep your credit card balance clear for exactly these moments, that way you’ll be able make charges when and where it’s absolutely necessary. Credit cards are excellent to have if you know how to control them. But the flipside of the coin is that they can end up controlling you. And if you’ve never had one before, it can happen a lot faster you think. Be careful!